Jeanne, will you marry me? For the last couple of years Jean and I have been talking about marriage on and off, and Jean has asked me to marry her on a number of occasions. I said no every time. I just wasn’t ready, you know. But all of that has changed, and I am ready to make the ultimate commitment to the woman I love so, so freaking dearly. Why my mind changed? Time. Jeanne and I have lived together now for three years and, although we have had our fights like every other couple, I knew that living together constantly for three years and surviving each other’s quirks and other things was the ultimate challenge. And we got through it all! Plus, I love her so freaking much. So there is also that. Jean and I have been together for nine years and one day today, with yesterday being our nine-year anniversary. On the 2 October we officially started dating, so I decided to keep it and propose to her on that day, too. I have been planning this day for a whole month, I don’t know how I have kept it a secret. I am so bad at keeping secrets because I get so freaking excited. But i did, and it was perfect! Over the last month I have been thinking about how I am going to propose. I am not a person who enjoys elaborate celebrations or public displays, so I decided to ask Jean to marry me at the place we spend most of our time together, our home. Our home is a special place, it is the place where we catch up and talk about our days, eat and cook dinner together, and spend our weekends relaxing with our boys – it is our happy place and I could not think of a better place to propose. Next, the ring. I went down an unconventional route when it came to the ring. But that is no surprise really, I am an unconventional person after all. Jeanne will you marry me? Illustration by Coral-Leigh Stuart-deLange. I want us to design her ring together and have it made by Dear Rae, a local jewellery maker who makes stunning one-of-a-kind engagement and wedding rings. 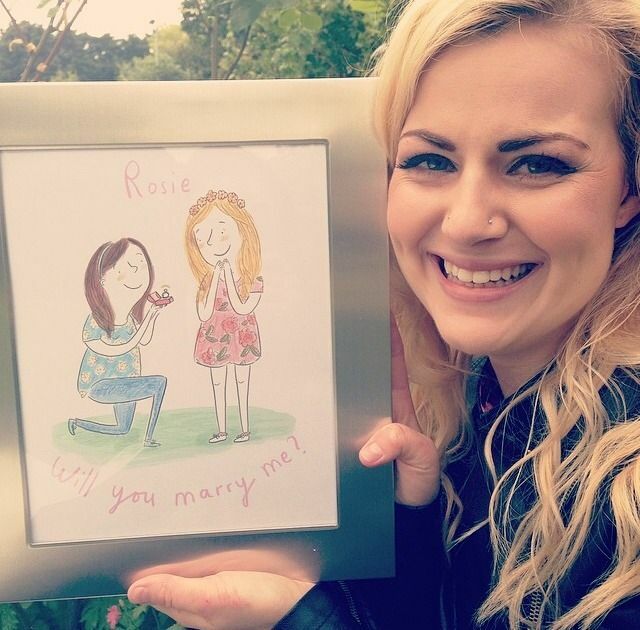 I got this idea from a YouTube couple Rose and Rosie, who did the same thing. You can see their gorgeous illustration, here. I did pick out a couple of rings from Dear Rae that I love and would like to combine, however, Jean’s opinion means so much, so we will go through the process together. 1. Hammered Band in Silver | 2. Three Edge Rose Gold Band (with black diamonds) | 3. Diagonal Striped Men’s Band | 4. Striped Men’s Band | 5. Half Diagonal Striped Men’s Band. Ideally I would like to combine the top two women’s rings together, but would like the Hammered Band in Silver to be while gold instead, and I would like it to include three small black diamonds, as I feel like Jean would really like this. However, her choices surprise me sometimes, which is also why I want her to be involved in the designing process. But that is what I would have chosen myself for her. Additionally, I love the striped men’s bands, and I would probably pick the Half Diagonal Striped Men’s Band if I had to choose one without a stone. Again, I would choose it in white gold. But I really hope that we can agree on a ring that includes stones, as they are more fitting for an engagement ring and I would so love to treat her to something sparkly! We would choose this kind of band if they can make it in white gold, too. The third thing on my list was phoning our parents, as I could not make such a massive decision without talking to them and telling them my plans, it’s only the respectful thing to do in my opinion. I phoned not because I was looking for approval, but more because it is a very big decision and very big moment in life and I wanted them to know and to be a part of it as they are so important to me. I phoned my mum and sister first, then my dad, and then Jean’s mum. To be honest, I was so incredibly nervous with every phone call I made. However, it didn’t seem like I had very much to worry about, as everyone was very excited. The Proposal – Will you Marry Me? The last few things I had to think about was what I was going to do and any decor I wanted to include. After a thorough search on Pinterest – you know how us girls are – and putting together a small board of ideas (which you can see here), I chose to have a small picnic in our garden (if the weather was glorious) or in our lounge (if the weather was shite) and some homemade bunting that reads “Jeanne will you marry me?”. Yes, cheesy, I know! But it worked and I thought it looked simple and cute. Jean reacted like I hoped she would, she was surprised and absolutely overjoyed. Her eyes have a way of lighting up when she is happy, they almost change colour and shine so bright, and it happened the moment I asked her. Like all of her dreams had come true in one sentence. You will be glad to know that she said “yes”. I’m glad she said yes! Well, Jean and I will talk about when we want to get married and start saving and planning what we want. We both have very different tastes and ideas of what our perfect wedding day would be like, and there is so much to think about. What we do know, however, is that we want it to be small, intimate and we want to pay for it ourselves. Another thing to consider is that we will both want my family from overseas to be here, and if my grand parents can’t travel, I would like to have a ceremony there, too. So, that’s it for now. I am so excited for what’s to come and I am sure there is a lot of wedding-themed blogging going to be taking place. So I hope you stick around! Congratulations! Theres.. nothing better than being at home and asking the one you love to marry you in your own comforting place. Such a beautiful moment. I hope my partner says yes, it has been years we have been together and its time to pop the question. Its a moment she will remember for the rest of her life, this was the most sweet proposal ever. Well done I absolutely love the idea.